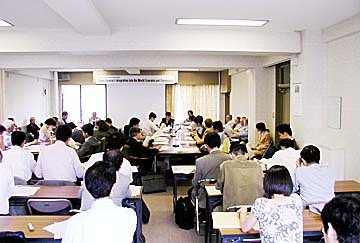 On July 16-19, 2003, the SRC Summer International Symposium was held under the title "Slavic Eurasia's Integration into the World Economy and Community." Eleven foreign scholars were invited from Russia, the United States, the United Kingdom, Germany, Kazakhstan and China to give presentations with five Japanese scholars. This symposium was prepared as the first conference of the 21st century COE program "Making a Discipline of Slavic Eurasian Studies: Meso-areas and Globalization," although the adoption of this program was officially announced just after the opening of the symposium. One of the main topics discussed at the symposium was the important role of the oil and gas sectors in understanding the peculiarities of Russia's integration into the world economy. Statistical and econometrical analyses on this account were presented by top specialists. As "meso-area" is one of the key concepts of the new COE program, there are three panels devoted to the integration processes in three meso-areas, including Eastern Europe, Central Asia and the Russian Far East. In these panels relations between these meso-areas and neighboring areas outside Slavic Eurasia were extensively discussed. The proceedings of the symposium will be soon published as one of the COE's new series, Slavic Eurasian Studies. Wolfram SCHRETTL (German Institute of Economic Research, Germany) "Russia's Integration into the World Economy"
Vladimir POPOV (New Economic School, Russia) "Accumulation of Foreign Exchange Reserves and Long Term Growth"
SENGOKU Manabu (Seinan Gakuin U, Japan) "Emerging Eastern European Welfare States: Race-to-the-bottom?" OHTSU Sadayoshi (Osaka Sangyo U, Japan) "Changing Characteristics of International Labour Migration in the North East Asia: With a Focus on Russo-Chinese Border"
IWASHITA Akihiro (SRC) "The Shanghai Cooperation Organization and Its Implications for Eurasian Security: A New Dimension of 'Partnership' after the Post-Cold War Period"
Victor KUZNETSOV (Samara Regional Administration, Russia) "Informational and Cultural Changes in Present-Day Russia and their Influence on the Political System"
UEGAKI Akira (Seinan Gakuin U, Japan) "Russia and the IMF"